Saturday, Oct. 14, 2017, 8 a.m. – 5 p.m.
A Day of Caring- Inspiring Community Commitment. 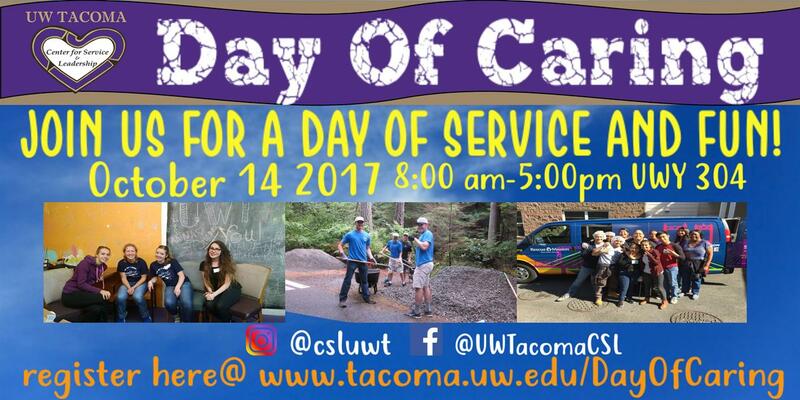 Join over 100 UW Tacoma students, faculty and staff as we align hands, hearts and minds to our urban-serving mission in one epic day of service! Come make new UW Tacoma friends in a service team and get to know and serve with local nonprofits in Tacoma. WHAT: This 'Day of Caring' is more than a one day community service event. It is a tone and a mindset of service that we hope will spread across our campus and community. We will be learning about and serving with nonprofits all across Tacoma, who are making positive daily impacts in our communities. We will hear from a keynote speaker, enjoy snacks, and get an introduction to the nonprofits we will be working with. Volunteers will be placed at sites depending on availability and your interest indicated in the registration form. So please come have fun, make connections student and community connections, learn about community needs and lend a hand toward some community projects.